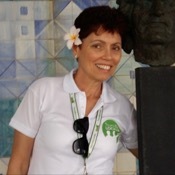 Traveler Review for Private Tour in Rio de Janeiro, Rio de Janeiro, Brazil by Tour Guide Rosangela F.
About Rosangela F. Message Rosangela F.
Rose was very knowledgeable...customized the tour to our needs. She also set us up with a FABULOUS driver, Solis, to do a day at the beach. He was a joy. TOUR GUIDE RESPONSE: Hello Renee and everyone. Hope you are all fine! Thanks very much for such a nice review. It was my pleasure to be with you all and I am sure you carried home beautiful memories of our day together. I am very happy that Silas made your day at the beach. He is my guy whenever I need support. Will be waiting for you soon in Rio. My kindest regards to all.